As I noted in my previous blog this is perfect Christmas dinner for just two of us. Since I had quite a few pieces of rendered skin from last night when I cut up the duck I used it as a bed form my legs so that the meat will not dry up. 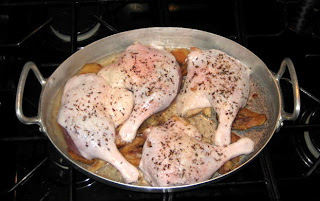 Both sides of legs were sprinkled with a bit of salt even though they were brined and about a tablespoon of crushed caraway seeds. Incredibly, there is no garlic. 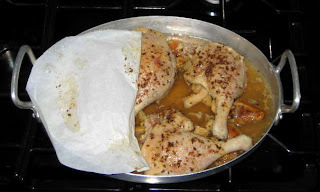 I covered the legs with parchment paper and then aluminum foil. The paper is there because the salt on duck would burn holes in aluminum if it comes into direct contact. I use it every time if aluminum foil would touch piece of salty food. First half hour in 375°F, then 350°F for 2 hours and back to 375°F for 15 - 30 minutes or till skin is golden. 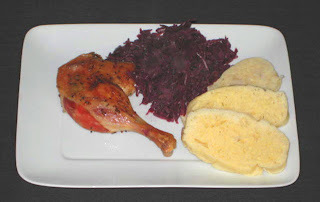 It is served with sautéed red cabbage (from jar J) and steamed dumplings. Ready to be covered and roasted. After 2 hours uncover and roast until golden brown.